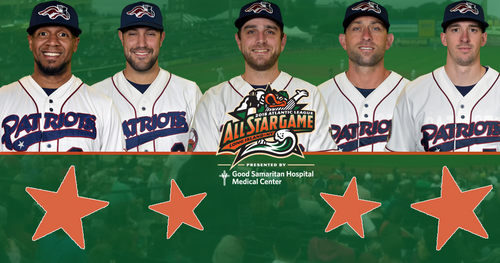 Bridgewater, NJ- The Somerset Patriots have announced that five Somerset Patriots have been selected by the Atlantic League of Professional Baseball and the fans as 2018 All-Stars. Pitchers Duane Below and Cory Riordan, outfielder Julio Borbon, infielder Alfredo Rodriguez, and utility player Mike Fransoso will represent Somerset on the Liberty Division squad. The Atlantic League’s 21st Annual All-Star Game will be held at Bethpage Ballpark, the home of the Long Island Ducks, on Wednesday, July 11th at 6:35 p.m.
CLICK HERE FOR FULL ROSTERS! Below will be making his second-straight Atlantic League All-Star appearance in his second season with the Somerset Patriots. He is 4-2 with a 3.19 ERA (seventh in the league), and 45 strikeouts against just 10 walks in 56.1 innings pitched over 10 starts. The southpaw has allowed more than three earned runs in a start just once this year and has not walked more than two batters in any appearance. Below’s .211 BAA (batting average against) and 0.99 WHIP (walks + hits / innings pitched) each rank third in the league while his 1.59 BB/9 ranks fifth. The lefty went 5-1 last year with a 2.88 ERA over 62.1 innings pitched and carried a 2.21 ERA in the first half en route to an All-Star Game selection. Riordan will also be making his second-straight Atlantic League All-Star appearance. In his first season with the Somerset Patriots and third in the Atlantic League, Riordan has a 3-3 record, a 3.07 ERA and a league-leading 70.1 innings of work over 11 starts. His 57 strikeouts rank third in the league while his ERA is fifth-best. The righty has worked at least five innings in each of his 11 starts this year and has three eight-plus strikeout performances over his last four starts. He played with the Bluefish in 2015 and 2017; the latter season in which he was named an All-Star, carrying a 7-3 record with a 3.29 ERA and 88 strikeouts against just 11 walks over 93 innings pitched in his 14 starts with Bridgeport. Riordan’s contract was purchased by the Fubon Guardians (CPBL) shortly after last year’s All-Star Game, where he finished the season. Borbon is in his first season with the Somerset Patriots and the Atlantic League. The former major leaguer is batting .306 with five home runs and 33 RBI over 53 games this year. He ranks third in the league in runs (38), doubles (15) and stolen bases (17), fourth in hits (66) and triples (2), ninth in RBI and tenth in batting. He has held five separate seven-game hit streaks this season and has hit safely in 43 of the 53 games in which he has played. The speedy outfielder has five years of service in the big leagues, including three with the Texas Rangers (2009-11), one with the Chicago Cubs (2013) and one with the Baltimore Orioles (2016). He broke onto the scene with a .312 average and 19 stolen bases over 46 games in 2009. Borbon played 137 games with the Rangers the next season and hit .276 with 15 steals and a career-high 42 RBI. Rodriguez is in his second season with the Somerset Patriots and second in the Atlantic League. His .299 batting average ranks 12th in the league, while his average and RBI totals (23) lead all Liberty Division shortstops. Rodriguez has played in a team-high 59 games (second in the league) and boasts nine doubles, nine stolen bases, 26 runs and 60 hits. He is also currently riding a team-high 14-game on-base streak, dating back to June 16th. The natural shortstop hit .257 with a home run, 32 RBI and 14 stolen bases with the Patriots last year. He led the team in doubles (20), ranked second in games played (112), at-bats (405), hits (104) and finished third in runs (57) and walks (50). Additionally, Rodriguez hit .412 (7-for-17) with three runs in the playoffs. Fransoso is in his first season with the Somerset Patriots and in the Atlantic League. He leads currently leads the team with a .322 batting average along with two home runs and 19 RBI over 54 games played. The former Rockland Boulder leads the league with a .426 on-base percentage and ranks third in triples (3), sixth in batting and walks (29), seventh in runs (34) and 11th in hits (55). Fransoso has also split his time defensively at number of positions, including second base, third base, shortstop and left field. Fransoso spent the previous two seasons with the Rockland Boulders in the Can-Am League. The left-handed hitting infielder finished second on the team in batting in 2016 with a .291 average along with six home runs, 43 RBI and a .395 on-base percentage (OBP) over 86 games. Fransoso followed that up with a strong season last year in which he batted .272 with four home runs, 38 RBI and a career-high .406 OBP.